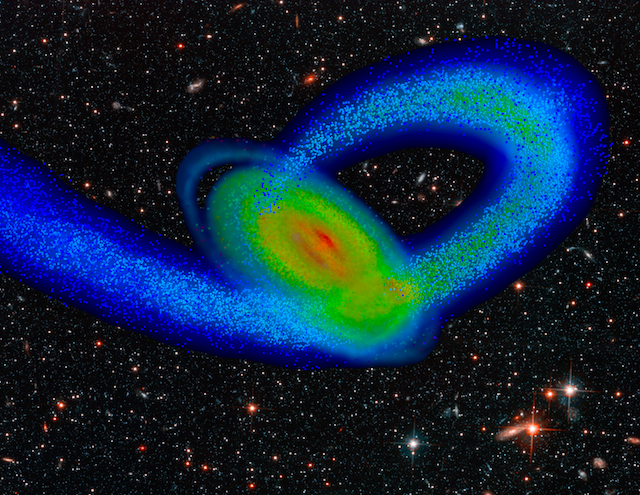 Did colliding dwarf galaxy make Milky Way spiral? 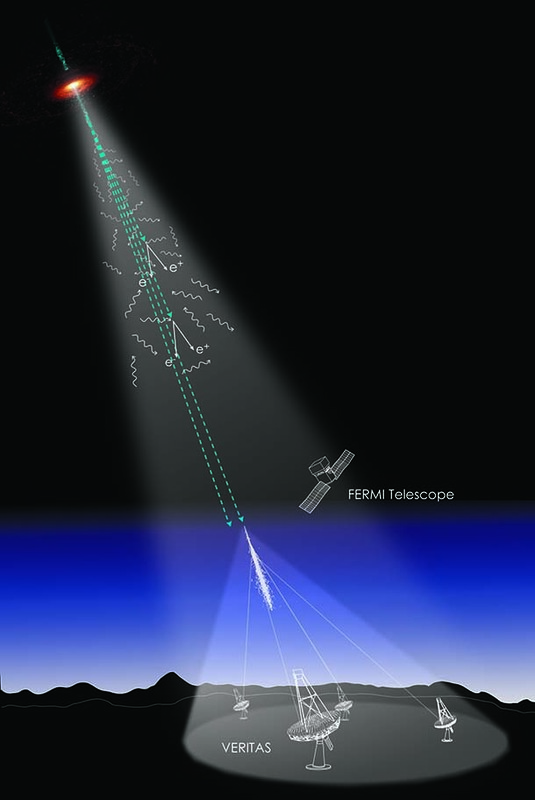 The Press Room highlights computational astronomy work around the UC-HiPACC consortium; the wording of the short summaries on this page is based on wording in the individual releases or on the summaries on the press release page of the original source. Press releases below appear in reverse chronological order (most recent first); they can also be displayed by UC campus or DOE lab by clicking on the desired venue at the bottom of the left-hand column. Funding has not been renewed for 2015 and beyond for the five-year-old University of California High-Performance AstroComputing Center (UC-HiPACC). UC-HiPACC’s major programs are therefore suspended. Alternative sources of funding are now being sought. Meantime, a No-Cost Extension to the grant has been approved through March 31, 2015, to support limited operations, including the pioneering AGORA research effort, preparation of a five-year report, and crafting of proposals for outside support. Pending receipt of alternative funding, some suspended programs may be resumed. UC-HiPACC 8/31/2014—Early, fast, turbulent mixing of gas within giant molecular clouds—the birthplaces of stars—means all stars formed from a single cloud bear the same unique chemical “tag” or “DNA fingerprint,” writes computational astronomers at University of California, Santa Cruz in the journal Nature, published online on August 31, 2014. Could such chemical tags help astronomers identify our own Sun’s long-lost sibling stars? 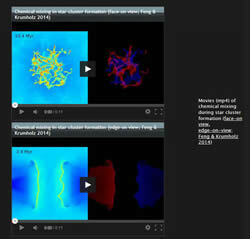 Two 11-second movies shows a computational simulation of a collision of two converging streams of interstellar gas, leading to collapse and formation of a star cluster at the center. August 31, 2014 — Early, fast, turbulent mixing of gas within giant molecular clouds—the birthplaces of stars—means all stars formed from a single cloud bear the same unique chemical “tag” or “DNA fingerprint,” writes computational astronomers at University of California, Santa Cruz in the journal Nature, published online on August 31, 2014. Could such chemical tags help astronomers identify our own Sun’s long-lost sibling stars? Read the UC-HiPACC press release at http://hipacc.ucsc.edu/PressRelease/sibling-stars.html and watch the movies! Differences in supercomputer simulations to be compared in the AGORA project are clearly evident in this test galaxy produced by each of nine different versions of participating codes using the same astrophysics and starting with the same initial conditions. A long-standing difficulty with supercomputer simulations of the formation and evolution of galaxies has been getting consistent results among different codes (programs) and with actual observations, so that computationally simulated galaxies look like real galaxies. While such conflicts could be evidence of complex physics in invisible dark matter, emerging evidence suggests that inconsistencies may originate from a poor understanding of processes involving ordinary matter as well as limitations in computational capability and differences in computer codes. Now, an ambitious new multiyear project—named AGORA, an ancient Greek word meaning meeting place, and an acronym for Assembling Galaxies of Resolved Anatomy—is under way to understand and resolve such inconsistencies. The attached figure illustrates how energetic gamma rays (dashed lines) from a distant blazar strike photons of extragalactic background light (wavy lines) and produce pairs of electrons and positrons. How much light has been emitted by all galaxies since the cosmos began? The Universe is suffused in a bath of almost every photon (particle of light) from ultraviolet to far infrared wavelengths ever radiated by all galaxies that ever existed throughout cosmic time. An accurate measurement of this extragalactic background light (EBL) is as fundamental to cosmology as measuring the heat radiation left over from the Big Bang (the cosmic microwave background) at radio wavelengths. A new paper, called "Detection of the Cosmic γ-Ray Horizon from Multiwavelength Observations of Blazars," by Alberto Dominguez and six coauthors, just published by the Astrophysical Journal—based on observations spanning wavelengths from radio waves to very energetic gamma rays, obtained from several NASA spacecraft and several ground-based telescopes—describes the best measurement yet of the evolution of the EBL over the past 5 billion years. Mosaic shows the sequence of events as two spiral galaxies like our own Milky Way merge. As the two galaxies approach (upper left), on their first close pass, they sideswipe each other, throwing out long tails of stars and gas (upper right). 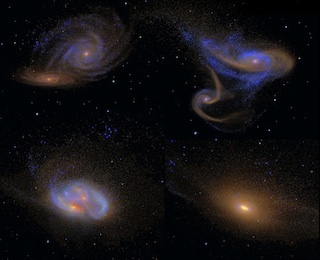 October 19, 2012 — Over the Last 8 Billion Years, Beautiful Rotating Disk Galaxies Like Our Own Milky Way Gradually Formed From Earlier Chaotic Systems. 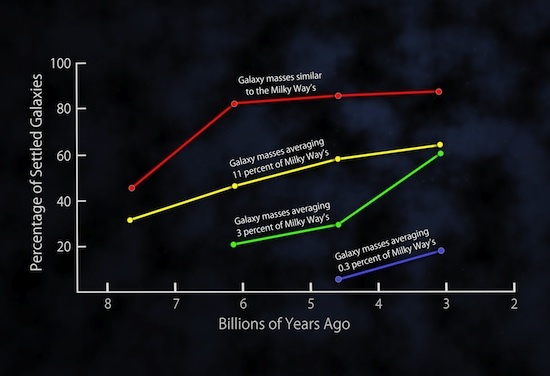 This plot shows the fractions of settled disk galaxies in four time spans, each about 3 billion years long. There is a steady shift toward higher percentages of settled galaxies closer to the present time. At any given time, the most massive galaxies are the most settled. More distant and less massive galaxies on average exhibit more disorganized internal motions, with gas moving in multiple directions, and slower rotation speeds. 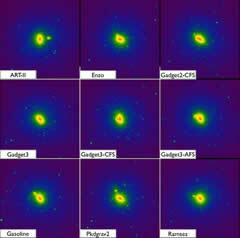 Spectroscopic observations of distant galaxies taken with the 10-meter telescopes at the W. M. Keck Observatory on Hawaii, when combined with images taken by the Hubble Space Telescope plus supercomputer simulations to help interpret the observations, together reveal a major surprise: that a standard assumption about the evolution of galaxies is not correct. Astronomers had thought that disk galaxies (like our own Milky Way) had largely finished forming by about 8 billion years ago, as indicated by the rates at which stars are formed in the Universe. Therefore, many astronomers have assumed that distant, much younger disk galaxies are not all that different from nearby ones. 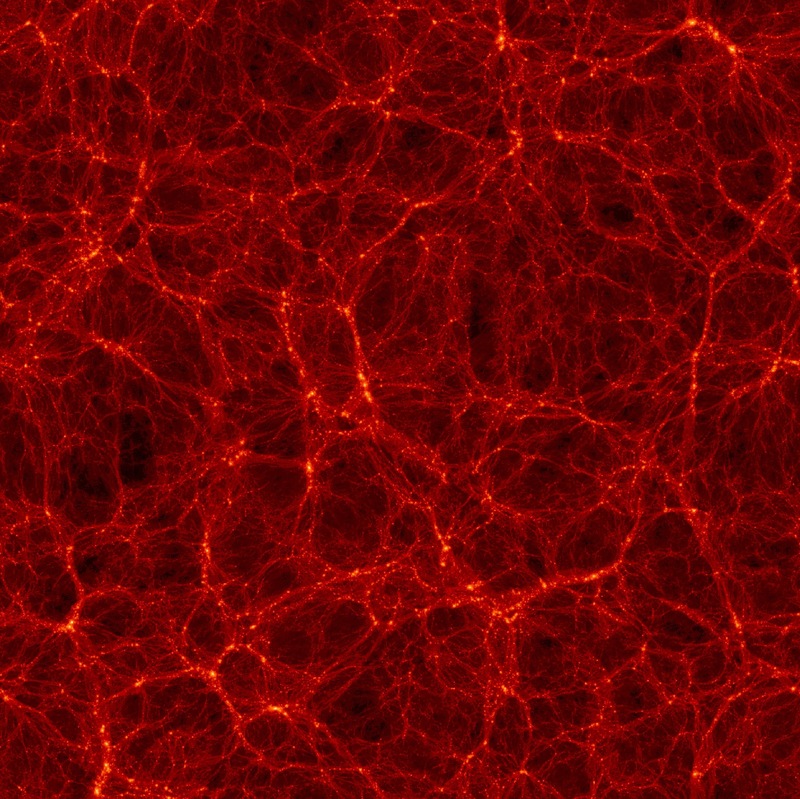 Snapshot from the Bolshoi simulation at a red shift z=0 (meaning at the present time), showing filaments of dark matter along which galaxies are predicted to form. Two research articles describing the most accurate cosmological simulation of the evolution of the large-scale structure of the universe yet made—named “Bolshoi” (the Russian word for “great” or “grand”)—have been accepted for publication in the Astrophysical Journal. The results calculated by the Bolshoi simulation and saved for later analysis—spectacular visualizations of what the universe was like at 180 different times from the Big Bang to the present epoch—are being made publicly available to the world’s astronomers and astrophysicists. Incoming third impact of the Sagittarius Dwarf galaxy (blue stream of stars) with our Milky Way Galaxy (multicolored disk) was simulated by supercomputer and rendered by Erik J. Tollerud against a background of galaxies seen in the Hubble Deep Field. A dwarf galaxy that has collided twice with our own Milky Way galaxy, and that is now coming around once again for a third impact, may well have triggered the formation of the Milky Way’s beautiful spiral arms beginning more than two billion years ago. That is the main conclusion of a paper by Chris W. Purcell and four coauthors published today in the internationally renowned British research journal Nature. Purcell’s findings are based on supercomputer simulations conducted for his Ph.D. dissertation completed in 2010 at the University of California, Irvine, a member of the University of California High-Performance AstroComputing Center (UC-HiPACC).